Hi, I am interested in your 1968 Ford F100 (stock #1239-NSH) listed on Autotrader for $56,995. I'd like to get more information about this vehicle and confirm its availability. 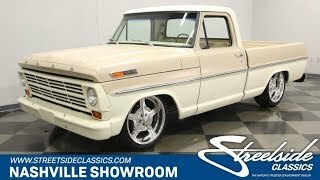 If you are the kind of person who appreciates a timeless design executed with an attention to detail that separates it from the crowd, then you will appreciate this very fine example of an F100. Its classic good looks are updated and re-imagined with modern techniques and technology, and the results are quite impressive. Check it out. Starting with the crisp, clean lines of this 68 Ford, a team of professionals went to work to accentuate those lines and complement them. Lowering the truck with a bit of chassis rake so those big chrome wheels tuck way up into the fender wells gives it a dramatic look right off the bat. When the decision was made to coat the truck in a matte paint job, the body men knew the panels had to be perfect before a drop of paint was applied. The quality of workmanship is outstanding and it sets the gold standard for this type of paint. To complement the look even further, the grill and the bumpers are featured in body color while being very discreet about the use of chrome with just the hardware shining like silver jewelry. The only other chrome is a slash of it that divides the two-tone paint and is perfectly straight as is cuts across the body panels from front to rear accenting the crisp clean body lines of the body even further. Open the door and you will find an interior that continues the quality of workmanship and attention to detail that is evident on the body. The soft colors of the two-tone tan continues starting with the understated elegance of the simple door panel dressed up only with stainless fasteners and a chrome window crank. A tan three-spoke steering wheel has a Ford center button and a semi-circular horn ring along with a with the shifter for the automatic transmission are both dressed in chrome. The dash itself is almost impossibly perfect with its black speedometer and tan oval surround with stainless hardware and black and polished control knobs below it. The center dash holds the ventilation controls along with the Vintage Air system to keep you cool during those hot summer cruises and car shows and the bench seat is a comfortable work of art with a tasteful tartan cloth surrounded by tan vinyl. The modern tech in this truck really shines in the chassis and engine updates. Pop the hood and take a peek. The first thing you will notice is that the outstanding workmanship of the rest of the vehicle continues with the presentation of the 390 cubic inch motor nestled down in a meticulously detailed out engine bay. A chrome air filter assembly feeds an Edelbrock 4-barrel carburetor and intake manifold while chrome valve covers add their splash of flash. All the accessories are new including the A/C compressor, power brake booster and master cylinder, radiator and all the belts and hoses. Stock exhaust manifolds flow back through Dynomax mufflers and all the power this motor makes flows back through a 3-speed automatic transmission. The suspension has been updated with new multi-leaf springs in the rear and a completely new front end with power rack and pinion steering working through tubular control arms and coil springs along with a sway bar to provide outstanding handling. 4-wheel disc brakes provide tremendous stopping power and the rubber meets the road through 275/40ZR20s in the back and 245/40ZR20s in the front mounted on those awesome Billet Specialties wheels. A timeless design, updated and re-imagined using modern tech, with a quality of workmanship that is second to none. The results are impressive. Come on down and check it out in person.